Background and objectives Kidney transplantation among HIV-infected patients with ESRD confers a significant survival benefit over remaining on dialysis. Given the high mortality burden associated with dialysis, understanding access to kidney transplantation after waitlisting among HIV+ candidates is warranted. Design, setting, participants, & measurements Data from the Scientific Registry of Transplant Recipients were linked to Intercontinental Marketing Statistics pharmacy fills (January 1, 2001 to October 1, 2012) so that we could identify and study 1636 HIV+ (defined as having filled one or more antiretroviral medications unique to HIV treatment) and 72,297 HIV− kidney transplantation candidates. Results HIV+ waiting list candidates were more often young (<50 years old: 62.7% versus 37.6%; P<0.001), were more often men (75.2% versus 59.3%; P<0.001), were more often black (73.6% versus 27.9%; P<0.001), had longer time on dialysis (years: 2.5 versus 0.8; P<0.001), were more often coinfected with hepatitis C virus (9.0% versus 3.9%; P<0.001), and were less likely to remain active on the waiting list (37.7% versus 49.4%; P<0.001). Waitlist mortality among HIV+ candidates was similar compared with HIV− candidates (adjusted hazard ratio, 1.03; 95% confidence interval, 0.89 to 1.20; P=0.67). In contrast, likelihood of living donor kidney transplantation was 47% lower (adjusted hazard ratio, 0.53; 95% confidence interval, 0.44 to 0.64; P<0.001), and there was a trend toward lower likelihood of deceased donor kidney transplantation (adjusted hazard ratio, 0.87; 95% confidence interval, 0.74 to 1.01; P=0.07) compared with in HIV− candidates. Conclusions Our findings highlight the need for additional study to better understand disparities in access to kidney transplantation, particularly living donor kidney transplantation, among HIV+ kidney waitlist candidates. Infection with HIV remains a major public health problem in the United States, with approximately 50,000 incident patients annually and a disproportionate burden of disease among minorities (1). With the introduction of highly active antiretroviral therapies in the mid-1990s, the effect of HIV infection transitioned from a debilitating and deadly disease to a chronic manageable comorbidity (2,3). Not surprisingly, as life expectancy of individuals who are HIV+ has increased, so too has the morbidity associated with chronic disease. Some studies indicate prevalence of CKD as high as 33% in HIV-infected patients (4), with substantially increased risk for ESRD (5). Data from the US Renal Data Systems document 900 incident patients with ESRD secondary to HIV-associated nephropathy annually (6). Unfortunately, recent long-term studies have shown that mortality among dialysis-dependent individuals who are HIV+ is 19-fold higher than their HIV− counterparts (adjusted hazard ratio [aHR], 19.4; 95% confidence interval [95% CI], 2.6 to 144.3; P=0.004) (7). Kidney transplantation (KT) among patients who are HIV+ and have ESRD confers a significant survival benefit over remaining on dialysis (8), and excellent long-term graft outcomes have been shown (9). As a result, recent efforts have focused on increasing availability of KT among selected individuals who are HIV+ and have ESRD; how these patients ultimately fare after evaluation and waitlisting remains uncertain. It is unknown if the high mortality rates observed in the broader HIV+ dialysis population might translate to higher waitlist mortality among those who are HIV+ and have ESRD who are selected as KT candidates. There are no data regarding deceased donor or living donor KT rates among this vulnerable population. Transplant community concerns regarding higher rates of acute rejection post-KT in HIV+ recipients might result in increased caution in offering KT (9,10), resulting in HIV+ waitlist candidates achieving KT at lower rates than their HIV− counterparts. Moreover, it is well documented that individuals are most likely to identify living donors from within their own social network; because an HIV+ individual has not yet been approved as a living kidney donor, there may be a corresponding effect on access to living donor transplantation among HIV+ candidates (11–15). Given the high morbidity and mortality associated with dialysis and the survival benefit that KT offers this vulnerable population, characterization of the HIV+ kidney waiting list and understanding access to deceased and living donor KT after waitlisting among HIV+ candidates are of paramount importance. Because of privacy concerns, the Organ Procurement and Transplant Network (OPTN) does not record HIV status at the time of waitlisting, and as such, the transplant community has been unable to identify HIV+ waitlist candidates beyond single-center registries. To better understand access to KT among HIV+ waitlist candidates, we performed a novel data linkage using Intercontinental Marketing Statistics (IMS) pharmacy claims data and data from the Scientific Registry of Transplant Recipients (SRTR) to identify a national cohort of HIV+ KT waitlist candidates, enabling us to characterize waitlist mortality and rates of deceased and living donor KT. The study used data from the SRTR, which includes data on all donors, waitlisted candidates, and transplant recipients in the United States, submitted by members of the OPTN. The Health Resources and Services Administration of the US Department of Health and Human Services provides the oversight to the activities of the OPTN and SRTR contractors. Because HIV status is not collected by the OPTN when a patient registers for the waiting list, a novel linkage with pharmacy fill data from IMS Health was required to identify HIV-infected patients. IMS Health is a national data source that collects medication fills through participating pharmacies nationwide. 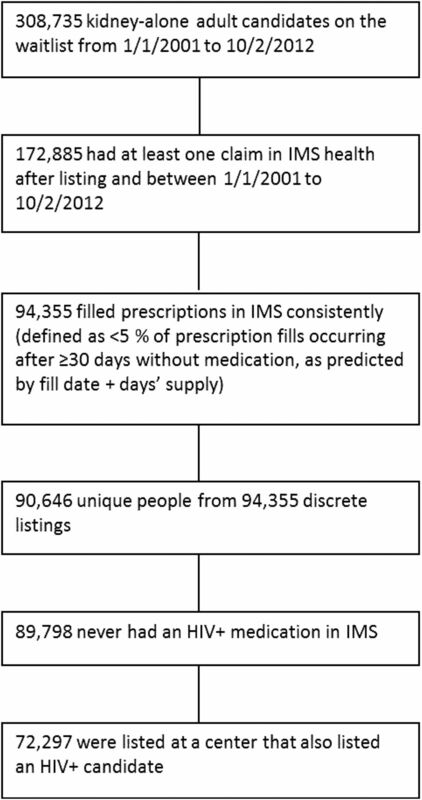 Although approximately 75% of waitlisted patients had at least one claim recorded in the IMS pharmacy database, 56% of incident kidney waitlist candidates from 2001 to 2012 had pharmacy fills in the linked IMS database that overlapped with their time on the waitlist. Candidates were required to have filled at least one type of medication for at least 95% of their time on the waitlist, while permitting gaps up to 30 days, to ensure that all study subjects had a consistent history of claims that would enable us to make assumptions about their HIV status. The clinical and research activities being reported are consistent with the Principles of the Declaration of Istanbul as outlined in the Declaration of Istanbul on Organ Trafficking and Transplant Tourism. The study was approved under an exemption by the University of Alabama at Birmingham Institutional Review Board. Adult KT candidates who filled at least one HIV-specific medication between January 1, 2001 and October 1, 2012 were identified through IMS pharmacy fills (n=1636) and considered HIV+ waitlist candidates (Figure 1, Supplemental Table 1). Adult KT candidates with medication fills that excluded HIV-specific medications during the same time period who were listed at a center that also had at least one patient who was HIV+ listed were also identified (n=72,297) and considered HIV− waitlist candidates (Figure 2). Construction of HIV+ cohort. IMS, Intercontinental Marketing Statistics. Construction of HIV− cohort. IMS, Intercontinental Marketing Statistics. Demographic and clinical characteristics of kidney-patient listings of those patients with continuous fills in IMS were compared with those listings not identified in IMS to assess generalizability to the broader kidney waitlist (Supplemental Table 2). Variables were categorized and compared using chi-squared tests of independence. No clinically significant differences were observed. Within our IMS-defined waitlist cohort, candidate characteristics were compared by HIV infection status (HIV+ versus HIV−). Continuous variables were analyzed using Wilcoxon rank sum tests, and categorical variables were examined using chi-squared tests of independence. The primary outcomes were waitlist mortality and transplantation. Death dates were supplemented by information from the Centers for Medicare and Medicaid Services and the Limited Access Death Master File available from the National Technical Information Service. Multiple simultaneous listings were collapsed. Exposure time began at the later date of waitlisting or first HIV medication fill and ended at the earlier date of patient death, transplantation, or administrative end of study (October 1, 2012). Cox proportional hazards mixed effects models were built to identify risk factors for waitlist mortality and transplantation (overall, living donor transplantation, and deceased donor transplantation). Adjusted analyses included all of the covariates from the most recent SRTR program specific report kidney waitlist mortality models, which were run on a national cohort of kidney waitlist candidates from 2012 to 2013. Covariates were chosen using the least absolute shrinkage and selection operator procedure as described by Snyder et al. (16). The following fixed effects were included in all models: listing era, candidate age, race, panel reactive antibody, blood group, willingness to accept hepatitis C virus seropositive or expanded criteria donor kidneys, history of diabetes mellitus or hypertension, status on the waiting list (active versus inactive), dialysis time at listing, and United Network for Organ Sharing region; and the following random effects were included: candidate organ procurement organization and random slope per organ procurement organization for HIV+ candidates. Interaction terms between HIV status and candidate characteristics were explored to assess potential effect modification. Models containing only fixed effects were compared with models containing both fixed and random effects to assess fit. Competing risks analysis was performed to obtain cumulative incidence of waitlist mortality, delisting, and transplantation. All statistical analyses were performed using SAS, version 9.4 (SAS Institute, Cary, NC) and R, version 3.1.3 (R, Vienna, Austria). Waitlist candidate characteristics by HIV infection status are listed in Table 1. Between January 1, 2001 and October 1, 2012, 1636 HIV+ and 72,297 HIV− waitlist candidates were identified. HIV+ waitlist candidates were younger (<50 years old: 62.7% versus 37.6%; P<0.001), more often men (75.2% versus 59.3%; P<0.001), and more often black (73.6% versus 27.9%; P<0.001) compared with HIV− waitlist candidates. HIV+ candidates spent more time on dialysis at the time of waitlisting (years: 2.5 versus 0.8; P<0.001) with fewer preemptive listings (9.7% versus 25.9%; P<0.001), were more likely to be coinfected with hepatitis C virus (9.0% versus 3.9%; P<0.001), and were less likely to remain active on the waiting list (37.7% versus 49.4%; P<0.001) (Table 1) compared with their HIV− counterparts. Moreover, HIV+ candidates were more likely to be normal weight (body mass index =20–25: 35.5% versus 22.6%; P<0.001) and less likely to have had peripheral vascular disease (2.1% versus 5.0%; P<0.001) compared with HIV− candidates (Table 1). HIV+ candidates were more likely than HIV− candidates to have had Medicare insurance (61.7% versus 43.6%) and less likely to have had private insurance (27.6% versus 47.8%; P<0.001). The largest proportions of HIV+ candidates were waitlisted in OPTN regions 2 (26.5%; 433 of 1636), 3 (13.3%; 217 of 1636), 5 (14.7%; 240 of 1636), and 9 (13.9%; 228 of 1636). Six OPTN regions listed a greater proportion of HIV− than HIV+ candidates (P<0.001) (Table 1). HIV+ candidates had similar waitlist mortality compared with their uninfected counterparts (5.61 versus 6.62 per 100 person-years [PY]). Similar to HIV− candidates, waitlist mortality was lowest among HIV+ candidates who were young (18–34 years old: 4.04 per 100 PY versus 65+ years old: 7.35 per 100 PY), black (black: 5.19 per 100 PY versus non-Hispanic white: 9.19 per 100 PY), active on the waiting list (active: 6.90 per 100 PY versus inactive: 8.26 per 100 PY), and privately insured (private: 4.61 per 100 PY versus Medicaid: 8.36 per 100 PY); HIV+ candidates with longer time on dialysis (11+ years; HIV−: 7.18 per 100 PY versus HIV+: 8.93 per 100 PY) and Medicaid insurance (HIV−: 6.08 per 100 PY versus HIV+: 8.36 per 100 PY) had higher waitlist mortality than their HIV− counterparts (Figure 3, Table 2). Cumulative incidence of waitlist outcomes. Removed from waitlist refers to those candidates who were delisted for reasons other than transplant, death, or deteriorating health, including refused transplant, medically unsuitable, improved condition, changed to kidney-pancreas listing, unable to contact, or other. The adjusted likelihood of waitlist mortality was similar among HIV+ and HIV− candidates (aHR, 1.03; 95% CI, 0.89 to 1.20; P=0.67) (Table 3). There were no differences in likelihood of waitlist mortality across OPTN geographic regions. Overall, the KT rate among HIV+ candidates was lower compared with HIV− counterparts (14.32 versus 26.70 per 100 PY). In the modern era (2009–2012), the rate of KT among HIV+ candidates decreased by >60% compared with the rate of KT among HIV+ candidates in the 2001–2004 era and was 2.3-fold lower than that of HIV− candidates in the modern era (10.56 versus 23.79 per 100 PY). Similar to HIV− candidates, HIV+ candidates who were always active on the list and had private health insurance had the highest transplant rates, and racial minorities (blacks and Hispanics) achieved the lowest KT rates (Figure 3, Table 4). On adjusted analyses, HIV+ candidates were 28% less likely to achieve KT compared with HIV− candidates (aHR, 0.72; 95% CI, 0.64 to 0.82; P<0.001) (Table 3). There were no differences in likelihood of KT across OPTN geographic regions. Adjusted analyses also showed that HIV−infection was associated with lower rates of both deceased donor KT and living donor KT, even after controlling for factors known to be associated with lower KT rates, such as recipient race. Specifically, compared with HIV− waitlist candidates, HIV+ candidates were 13% less likely to achieve deceased donor KT (aHR, 0.87; 95% CI, 0.74 to 1.01; P=0.07) (Table 3) and 47% less likely to achieve living donor KT (aHR, 0.53; 95% CI, 0.44 to 0.64; P<0.001) (Table 3). In this first national study of HIV-infected kidney waitlist candidates, we found that HIV+ candidates were disproportionately young, black, and men compared with their HIV− counterparts. HIV+ candidates were more likely to be removed from the waiting list, and time to transplant from date of listing was significantly longer. 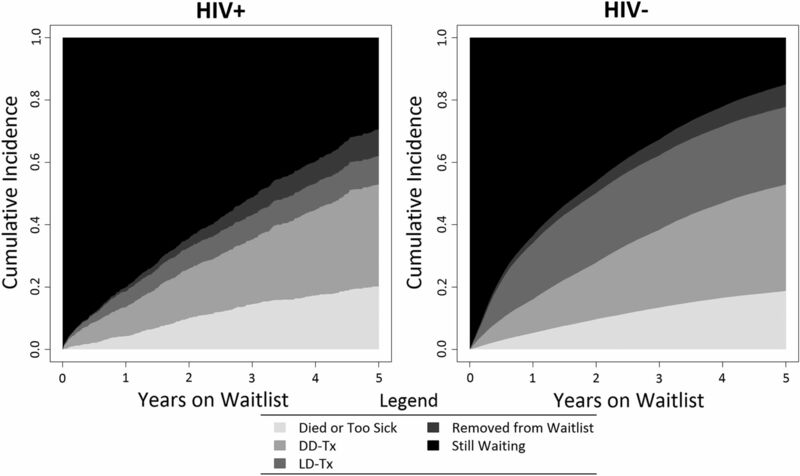 Although waitlist mortality rates for HIV+ candidates have improved over time, transplant rates have remained lower than those among HIV−candidates, reflecting both a trend toward decreased access to deceased donor transplants and the significant effect of an almost twofold lower likelihood of living donor transplantation among HIV+ candidates compared with HIV− counterparts. These novel findings have important implications. The finding of 28% lower likelihood of transplant overall among HIV+ waitlist candidates compared with their HIV− counterparts was disappointing and prompted the question of disparities in access to transplant. This was surprising, especially in the modern era (2009–2012), in light of the 2010 published findings from the National Institutes of Health (NIH) multicenter trial showing good post-transplant outcomes for HIV+ recipients (10). On subgroup analyses, we found a trend toward a lower likelihood of deceased donor KT among HIV+ compared with HIV− waitlist candidates, suggesting a potential disparity in access to deceased donor KT among HIV+ candidates. This finding was concerning and warrants further in-depth analyses of center- and provider-level practices, which are beyond the scope of this study. Moreover, we observed a 47% lower likelihood of living donor KT among HIV+ candidates compared with their HIV− counterparts. This is consistent with previous studies that have shown less living donor-related knowledge and willingness to pursue living donors among HIV+ candidates (17). Furthermore, studies have found that waitlist candidates are most likely to identify a potential living kidney donor from within their own social network (11,14). For HIV+ candidates, this may translate into identification of donors who are also infected with HIV. Until recently, acquisition of organs from an individual who is HIV+ was illegal as defined by the National Organ Transplant Act of 1984. Recently, however, the HIV Organ Policy Equity Act was signed into law, legalizing the transplantation of kidneys from HIV+ donors into HIV+ waitlist candidates, and includes a provision for living kidney donation from HIV+ individuals (18–20). This new potential pool of donors only accessible to HIV+ waitlist candidates may help mitigate current disparities (18,20). Much study will be needed to determine the safety and efficacy of such practice, particularly with regard to long-term health outcomes of potential HIV+ living donors. It is important to note that the observed 47% lower likelihood of living donor KT among HIV+ waitlist candidates compared with their HIV− counterparts was independent of recipient race. We showed that HIV+ waitlist candidates were disproportionately of black race, with 73.6% of the HIV+ waiting list made up of black candidates. Studies conducted within the general HIV− population have shown that black candidates are less likely than other racial groups to receive a kidney; in fact, black candidates make up nearly 30% of waitlisted patients but only 11% of living donor KT recipients (21–23). Given that black race and HIV infection are independent risk factors for lower living donor KT rates and that black candidates represent a disproportionate number of those on the HIV+ waiting list, it is likely that the disparities in access to KT observed among black candidates may be exacerbated in the context of HIV infection. Better understanding of the barriers to living donor KT among individuals who are HIV+ is of paramount importance to avoid widening the current gap in access to KT experienced by black candidates. Inferences on the basis of the results of our study must take into account additional limitations specific to the national transplant registry. Although these findings may reflect the effect of HIV-associated comorbidity among candidates, the OPTN does not collect data on CD4 count, viral loads, or infections and only collects limited data on acute rejection and malignancies, all of which are factors thought to influence long-term outcomes among HIV-infected patients on dialysis and transplant recipients. However, the NIH multicenter protocol, which has been adopted widely across the United States, uses relatively restricted criteria for waitlisting and transplantation of HIV-infected patients with ESRD, requiring undetectable viral loads and CD4 counts ≥200, and it is unlikely that there would be major deviations from this protocol within national data. Furthermore, during the study period, IMS Health only captured medication fills for 56% of those on the kidney waitlist, and as such, it is likely that our study underestimated the number of kidney waitlist candidates infected with HIV. It is also possible that a small number of patients who are HIV+ and did not fill any HIV medications during the study period were misclassified as HIV−. These would likely represent either elite controllers or noncompliant patients, and the latter would be screened out during the transplant listing process; even if included, these patients would have biased our findings toward the null hypothesis. Given that only 56% of incident kidney waitlist candidates had IMS fills, the generalizability of our findings may be limited; however, characteristics of kidney waitlist candidates with continuous fills captured in IMS compared with those not in IMS were comparable, suggesting no systematic bias in IMS coverage. Despite these acknowledged limitations, the data from this unique cohort are the first to describe the national HIV-infected transplant candidate population, and as such, they contribute new and important information about waitlist outcomes in this population. To date, this is the first national study to characterize the HIV+ kidney waitlist population and examine waitlist mortality and KT rates in this unique population. Our findings show no difference in waitlist mortality rates among candidates on the basis of their HIV infection status. In contrast, HIV+ candidates had a 47% lower rate of living donor KT and an observed trend toward to lower deceased donor KT as well. These results suggest the need for additional study to better understand disparities in access to transplantation among HIV+ kidney waitlist candidates, particularly living donor KT. This research was supported, in part, by National Institutes of Health grants K23-DK103918 (principal investigator: J.E.L. ), K23-CA177321-01A1 (principal investigator: C.D. ), and K24-DK101828 (principal investigator: D.L.S.) and US Department of Health and Human Services, Health Resources and Services Administration, Healthcare Systems Bureau, Division of Transplantation contract HHSH250201000018C (to S.G. and D.L.S.). The research was presented in preliminary forms as abstracts at the 2015 American Transplant Congress in Philadelphia, Pennsylvania, May 2–6, 2015. The data reported here have been supplied by the Minneapolis Medical Research Foundation as the contractor for the Scientific Registry of Transplant Recipients (SRTR). The interpretation and reporting of these data are the responsibility of the authors and in no way should be seen as an official policy of or interpretation by the SRTR or the US Government. See related editorial, “Opportunities and Challenges for Kidney Donation from and to HIV-Positive Individuals,” on pages 385–387. This article contains supplemental material online at http://cjasn.asnjournals.org/lookup/suppl/doi:10.2215/CJN.07460716/-/DCSupplemental.